We at White City are sad to announce the departure of our beloved lead singer: Pernille. After 2 years in Kabul an almost as long with White City, Pernille is heading back to Denmark. But she did not leave with out a bang, we threw a farewell party at Relax Guesthouse and a good 300 people turned up. 3 members of the band were out of town, so we were only a 3 piece, but we cranked it up and gave the stiff Kabul crowd a good rocking. From all of us at White City take care, you will be dearly missed and irreplaceable. Newsweek ran an interesting article this week containing a Q n A from Mullah Baradar: 2nd in charge of Taliban operations in Afghanistan. What is your reaction to the large increase in U.S. forces this year? Statements about the increase in troops do not affect the mujahedin at all. In fact, Americans are demoralized in Afghanistan, and they don't know what to do. [The Taliban] want to inflict maximum losses on the Americans, which is possible only when the Americans are present here in large numbers and come out of their fortified places. How long are you prepared to fight? The history of Afghanistan shows that Afghans never get tired of struggling until they have freed their country. We shall continue our jihad till the expulsion of our enemy from our land. Are some Taliban involved in secret talks with the Karzai government? Not a single member of the Taliban is involved in talks. What would be your conditions for talks if they were to take place? The basic condition is the withdrawal of foreign forces from Afghanistan. If breaking ties with Al Qaeda were a condition of a peace accord, would you do that? Our decisions are made on the basis of our national interests. Is Pakistan's Inter-Services Intelligence agency giving you support or advice? This is venomous propaganda that has no facts behind it. A vice-presidential candidate in Afghanistan's upcoming election has escaped unharmed from an attack on his convoy in the country's north, Afghan officials have said. Armed men ambushed the convoy carrying Mohammed Qasim Fahim as he was travelling through the northern province of Kunduz on Sunday, officials said. Fahim, who is a running mate of Hamid Karzai, the incumbent Afghan president, was travelling from Kunduz to Takhar province when the attackers opened fire with rockets launchers and machine guns. The former head of the Northern Alliance that helped topple the Taliban in 2001, Fahim was in the area to campaign on Karzai's behalf ahead of the August 20 poll. Mum dont read this. Bro you should. A friend and work colleague of mine recounts his embed experience with his brother in the same unit. With the presidential elections less than a month away, Abdullah and Ghani debated while an empty podium where Karzai should have stood. The first televised debate ahead of Afghanistan's presidential poll has been held - without Hamid Karzai, the country's president. Karzai, widely seen as the front runner in the August 20 election, pulled out less than 24 hours before the debate took place on the country's most popular television network on Thursday. An empty podium marked his absence while his policies were criticised by two of his biggest challengers, Abdullah Abdullah, the former foreign minister, and Ashraf Ghani, the former finance minister. The Karzai team said he had not been given enough notice for the debate on private TV channel Tolo, which they accused of being "59 per cent against Hamid Karzai". Karzai's campaign also said the president did not want to take part because all the country's 41 presidential candidates were not invited. Ghani, also a former senior World Bank official, has repeatedly asked Karzai to debate with him. "It is the Afghan public that will suffer another broken promise ... if the future plans of each candidate is not made clear standing side-by-side his or her rival," Ghani said on his website earlier this week. After months of planning our goal to tour military bases within Afghanistan finally became a reality. White City completed the first leg of our Combat Rock Tour. We played to the Swedes on day 1 and the Norwegians on day 2. As one can expect a crowd of (sober) soldiers was hard to get moving, but White City rocked em hard! We have many more bases in our sights, so both civilian and military peoples, stayed tuned to this URL to see more Combat Rock from White City. While the presidential election fulfill the expected prophecy of being a total fast, there are a group of civilians who are not waiting for the election results to forge their future. Villagers in a far-flung the eastern Nangarhar province stood against Taliban fighters killing three insurgents and detaining 11 others. "A group of Taliban militants raided the house of a police officer in Achin district Friday night but the locals took up arms and fought the insurgents. As a result three rebels were killed and 11others were made captive,"
Two of the killed Taliban insurgents were foreigners. This is the first time that these locals in Afghanistan stood against Taliban insurgents. My bro's band is at it again, if you wana see a pumpin, energetic, electro set.... Get down to the Revolver club in Prahan Thursday 23rd of July! It might not be headlines any more, but Iran's problems are far from over. Iran has passed a new internet law that experts fear will make information on internet users more readily available to the authorities. According to Press TV, the cyber law would provide internet users with "more security", as internet service providers are required to save all data sent and received by their clients for at least three months. But critics of the legislation say the stored data would enable the authorities to monitor internet users, including anonymous bloggers opposed to the regime in the Islamic republic. I popped into Australia last month for a quick hello. I caught up with my family and as many close friends as possible in the short time I was there. I also spoke about Afghanistan at some local schools. For the record can I just say that my niece Kirha is the coolest kid in the world. The magic of Photoshop or not? At about 2100hrs an AOG of approximately 20 members entered an INGO operated clinic in Shandi Tut that at the time was staffed by two guards. The AOG stayed in the clinic overnight before leaving in the early hours of the morning for an unknown location. No damage was caused to the clinic and no property was taken. During the night the guards, fearing for their own wellbeing, provided the AOG with refreshments as instructed. The guards were not harmed at any time. On arriving at his workplace the next morning the clinic manager heard of the incident from the guards and was able to forward a complaint to a significant local AOG personality. That person apologised on behalf of the AOG involved and explained that the group used the clinic in the absence of any other facility having traveled a considerable distance during the day. A group of five musicians from Jalalabad was playing at a wedding party in Khogyani District in the afternoon when several members of an AOG entered the party, and proceeded to use the instruments to assault the musicians before going onto to completely destroy the instruments and equipment. The musicians were then taken from the wedding party and eventually arrived at Merkhekhel in Sherzad. In Merkhelhel the AOG assembled a number of villagers to observe, and the heads of the musicians were shaved as they were made to promise to never play music again. The musicians were then moved a short distance from the village and tied to a tree where they were found the following morning by villagers on their way to morning prayer. As always White City has been a transient band with over 10 members in the last 3 years. Last month we lost dear sax player Diego as he went in search of the meaning of life. Next month our beloved Pernille is leaving Afghanistan to return to Denmark. But we have been lucky to have two new members in the band: Trygve on guitar, bass and banjo and Matt on drums. Yes that's right we have two drummers now! So we have been gigging around Kabul and next week we are off to do the first leg on our military base tour. Playing for the troops all over the country. So if you guys out there are reading this email.......Get ready cause White City is about to come rock your base! well the streets are actually quiet but its because of the heavy presence of the police. where ever there's supposed to be a demonstration the police and basij outnumber the people. some parts of Tehran look like a barracks.you can feel the anger in people. they don't talk too much.they go screaming in three seconds. (including me). there are lots and lots of stories.the story of people beaten in protests is nothing new. I hear some scary stories from people who were detained. man its horrible. I wish someone could have filmed what's going on in prisons. a close friend of mine was detained. he's now released but he doesn't seem normal. I took him to a psychiatrist. they were five people three girls two boys in a cell. the floor was filled with water so they couldn't sleep for three days.they were blind folded.one of the girls were wounded and kept screaming but when ever they cried for help,they would storm in and beat them and then leave.they have told them twice that tomorrow you'll be hanged and they kept hearing screams from other cells.I have heard some similar stories from others too. I know they sound horrible and unfortunatly they don't have any proofs. but I don't know how come the international media is looking for a proof. haven't they seen enough evidence from the streets. I know these things are true I have spent two nights in jail before and I know how they treat people. my only hope is that the world wouldn't recognize the results thats all for now. Something amazing with the birth, and I know no one will really ever believe me, it was that when he was laying on his mother’s belly … seconds after the birth, I was leaning forward on him, his first gesture as a human being was to raise a clenched first toward my face. 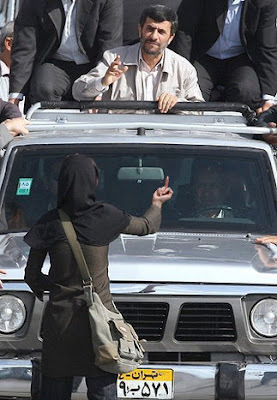 A little Iranian protester in the making.